Why Can’t Digital Be Normal? A simple luxury that 35mm photographers take for granted is the ubiquity of compact, well-corrected normal lenses—ones with maximum apertures ranging from f/1.8 to f/1.4. Most rely on a well-proven Gaussian formula, whose nearly-symmetrical configuration automatically reduces certain aberrations like barrel distortion. The fast maximum aperture provides several benefits: A bright viewfinder image that “snaps” into focus, and the potential for pleasingly shallow depth of field. Some photographers prefer a slightly wider lens as their “normal,” but on the 135 film format the typical 50mm focal length yields a very natural, neutral perspective. Fast “normal” lenses—why are they such rarities in digital photography? When one looks at the lens options for digital SLRs, however, the choices become a little murkier. By default, most DSLRs come equipped with kit zooms, with unavoidable penalties in lens size and maximum aperture. Many of these reveal quite obvious barrel distortion when zoomed to their widest setting. On the other hand, fast 50mm primes are still offered by most cameramakers—as holdovers from their earlier film-camera lens lineups. Yet on a typical DSLR with a cropped-format sensor, these stop being “normal.” Instead they function as short portrait lenses. That’s useful in many cases, to be sure; but it’s not the classic “all rounder” lens that 50mm represents on a traditional film camera. True, Sigma does offer a 30mm f/1.4 designed as a normal for cropped-format DSLRs; but its near-$500 pricetag is quite a shocker compared to past film-camera equivalents. Recently, my eye was caught by an Olympus DSLR, the E-420. With this model Olympus has finally delivered on their original promise of very compact camera bodies through the use of a new “Four-Thirds” sensor format, one about half the width of 35mm film. 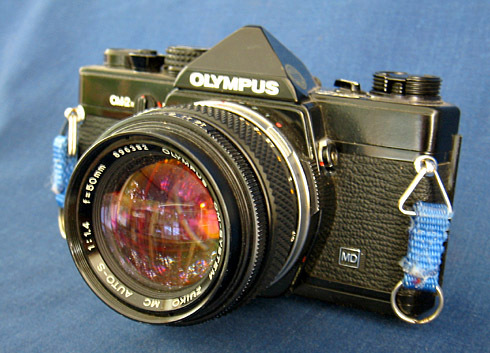 In fact the E-420 is one of the few DSLRs whose size compares to the classic Olympus OM series of film bodies. And even better, Olympus was pairing it with a new (non-zoom) lens—an impressively-tiny 25mm f/2.8 pancake. This focal length yields “normal” coverage on the smaller sensor format. But an f/2.8 maximum aperture is hardly going to set pulses racing among serious available-light enthusiasts. And unfortunately, a recent lens test at DPReview.com shows that the new pancake is only a middling performer. Even this digital-specific, blank-slate design showed significant barrel distortion, as well as (freakishly) chromatic aberration even near the center of the frame. Olympus is known for making some of the best-respected DSLR lenses today; yet their struggle was to design a well-corrected lens when the flange-to-sensor distance is significantly longer than the focal length. The classic symmetrical configurations don’t work in that case; so various optical shenanigans are required which inevitably degrade performance. At this year’s Photokina photo trade show, Panasonic caused a great deal of buzz with an announcement of their Lumix G1. Panasonic seems to have recognized that the Four-Thirds format has never gained much traction with enthusiast DSLR buyers; yet it would offer consumers vast improvements in image quality over today’s teeny-chipped point’n'shoots, if only the camera body could be shrunk to acceptable size. Panasonic’s way to achieve this was to omit the reflex mirror entirely (meaning only electronic viewfinders are possible), then halve the flange-to-sensor distance. This is the essence of a new “Micro Four-Thirds” standard, of which the the G1 is the first example coming to market (shortly). Olympus showed their own prototype of a Micro Four-Thirds camera, made even more compact by omitting any eye-level viewfinder. This emphasis on small body styles has led some to hail Micro Four-Thirds as the arrival of the “digital rangefinder”—i.e. 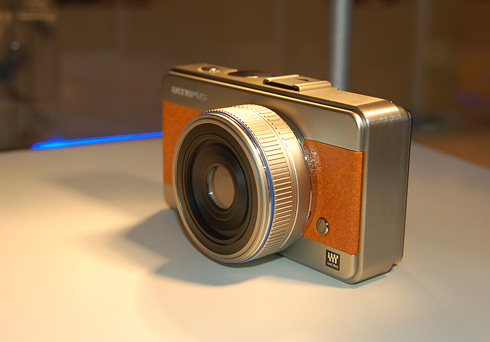 very compact cameras with interchangeable lenses. But to me the most intriguing footnote to these announcements is buried in Panasonic’s future “Lens Roadmap.” In 2009, allegedly they will introduce a non-zoom, 20mm f/1.7 lens in Micro Four-Thirds mount. If we translate that to its equivalent on 135 film, this would be a fast 40mm lens—actually, just like 1972′s Canonet!—with a “wide normal” coverage that I would personally love. And because of the reduced flange-to-sensor distance, its optical design might even be a simpler, well-corrected symmetrical design. So will compact, fast, well-corrected normal lenses come to digital, at long last? At a price we can afford? This remains to be seen, though I’m cautiously hopeful. But for the moment, virtually any random 35mm SLR from the past, equipped with its humblest possible lens option, offers something that remains a rarity in the world of digital. Update February 2009: Might Nikon be listening?